Relax and enjoy a taste of life on the shore in a superior locale that rests just across the street from the beach. Shorewalk is a top of the line resort in the beautiful Windy Hill region of North Myrtle Beach, South Carolina. This charming resort delivers an excellent location as well as three stories of outstanding, updated condominiums. With covered parking available guests will not have to worry about their vehicles as they are off frolicking in the Atlantic Ocean and the sun deck boasts a perfect spot for guests to simply relax and enjoy the warm South Carolina sunshine. A resort as warm and hospitable as Shorewalk will facilitate once in a life time beach vacations. 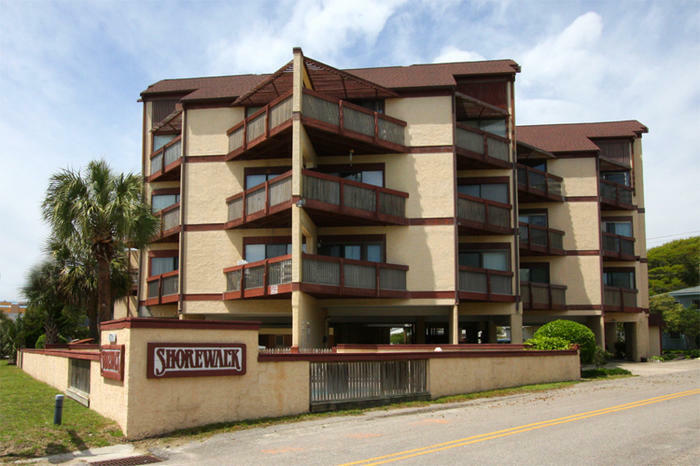 Shorewalk is an excellent vacation for those who want to simply get away and enjoy the beach in comfort. The rentals in Shorewalk are each a home away from home to all who stay there and, as such, offer all the creature comforts of home. The two-bedroom, two-bathroom condominiums can comfortably accommodate up to six guests for an unbelievable vacation on the South Carolina shoreline. These rentals all provide extras that will enhance vacations and take them from just a beach retreat to an unforgettable journey to the shores of Atlantic Ocean. Shorewalk offers updated condominiums that you will be pleased to consider your home away from home during time spent in North Myrtle Beach. Fully equipped kitchens and in unit washers and dryers provide the conveniences that might be lacking during a hotel stay. The rentals of Shorewalk offer private balconies and ocean views that will be a perfect backdrop as you enjoy your first morning cup of coffee or an evening glass of wine. Stepping beyond their North Myrtle Beach vacation rentals guests of Shorewalk will find themselves in an astounding location. Miles of stunning South Carolina shoreline are just across the street from this resort making it easy for guest to enjoy vacation days full of fun on the beach. The resort is also very near many of the most popular and exciting area attractions and activities. Everything that vacationers need to arrive, relax and enjoy will be waiting for them when they arrive for a beach vacation at Shorewalk. Guests can bring their family and enjoy more than just a getaway when staying at Shorewalk, they are sure to enjoy once in a lifetime days and create memories that will last a lifetime. Elliott Beach Rentals is not affiliated with onsite management or the HOA of Shorewalk.